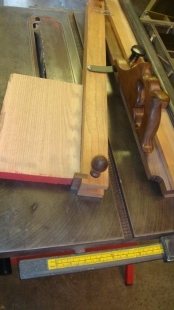 Homemade table saw angle guide constructed from wood and utilizing off-the-shelf components. Handle was patterned after an antique Disston saw, angle readout was adapted from a plastic protractor, and the stop was cannibalized from a commercial angle guide. Very nicely done...especially the handle...a true classic...begs to be handled.